Lake Erie Fishing Techniques for catching walleyes in the western basin. The beauty of fishing the weapon is that instead of carrying expensive lures in different weights and colors to cover the bases, one weapon can do it all. Simply change your weight to make it heavier or lighter and change the blade colors or sizes to find what’s working. You can incorporate a quick change clevis on your weapons so you can snap different blades on and off. I prefer a folded clevis because they spin with the slightest movement and also a deep cup # 4 Colorado Premium gold blade. The deep cup blade also spins much easier than a standard blade. I recommend spending the extra money on Premium Gold blades because they do not tarnish. The superior premium gold finish will flash much brighter definitely attracting more walleyes attention and getting you more bites! The Lake Erie Swing Presentation! Cast from either the bow or the stern of the boat as the boat drifts sideways. Cast about 45 degrees up-wind and close your bail right away. Here comes the count if the fish are suspended and marking around 25 foot the trick is to get your lure to make its swing back toward the boat just above the fish. Walleyes feed looking up in the water. When your lure hits the water lock your bail up and start your count. One thousand one one thousand two etc. A 3/4 ounce lure will sink at a rate of about one and a half feet per second. At a 16 count would put your lure at 24 feet, just above the walleyes marking at 25 feet. Crank your reel just enough to keep your line tight as the lure drops and retrieve the slack as it works around the swing. About ¾ of the way around the swing you will feel the lure get heavier as the boat drift starts pulling your lure. Slow your retrieve and let the boat finish pulling the lure around the turn. You will catch a lot of walleye on the drop when you keep a tight line during the swing. The second half of working the swing, slow your retrieve as the boat drift will start pulling the lure for you. When your line quits swinging around the boat start reeling back to the boat to cast again. This is when your line is dragging straight down and it is time to reel in and cast again. Don’t waste the prime fishing spots on the boat by dragging your spinners off the bow or stern. If you are a dragger fisherman then fish on the port or starboard sides of the boat. 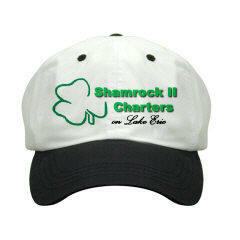 Switch with crew members who like to stand and cast their spinners. There is always a sweet spot in casting the swing. The trick is to find the sweet spot. Cast about ten minutes to the same spot and if you don’t get a bite then move your cast five feet up or down-wind of the boat and continue to do this until you find the sweet spot! Changing your casting angles in the swing can also help you find a hungry walleye. If you will feel a peck or it just feels heavier, set your hook and fight your walleye back to the net. The walleyes like to bite a lures that change angles much more than a straight dragging spinner. For the person standing next to the guy that’s catching walleyes, watch what he is doing and cast your lure the same length and at the same angle upwind and retrieve your line back at the same speed. If your lure comes in before his slow it down. You soon will be hooked up to a walleye. It is a little bit different fishing from each spot on the boat so when someone is hot in a certain spot don’t bump him out of his spot, it’s not the spot. They have the bite figured out from this spot. You need to pay attention to what they are doing and do it from your spot. Soon you will have everyone on the boat catching their own walleye. Stop reeling your line in and pull your rod from one side to the other side keeping your lure spinning then reel back as you sweep your rod back and forth to pull the lure again. This adds a jigging fall back action to your spinner and can be very effective. Then there is the smooth steady retrieve back to the boat. The stop and go retrieve is reeling two or three cranks and hesitate for 3 seconds and repeat that all the way back to the boat. You can also try raising and lower your rod tip while retrieving to produce a fall back jigging action on your spinner which entices walleyes to bite. Every day you will need to experiment with different weights due to the wind and current. The most crucial part of drift fishing is to know the count it takes for your lure to hit the bottom of the lake. The more times you get your lure is in the strike zone the more walleyes you are going to catch. Take several practice casts and count down until it makes contact with the bottom. Then start cranking two or three seconds before that you want your lure tight and spinning before it hits the bottom. Other tricks to get you in the fish are vary the length of line you cast, change weights and change where your lure hits the water, try a different count and retrieve. Crew members fishing on the downwind side of the boat should cast and leave your bail open while you count down. Because you are casting directly with the wind, you need to leave your bail open to get to the right depth. From this spot on the boat is where you don’t have to cast unless you want to. When your spinner gets close to the boat open your bail and let it back out and work it in and out. This is a good spot for the elderly and kids. it’s also a good area to run bottom bouncers under the boat with heavy weights. To set a bottom- bouncer stop it two or three times on the way down to the lure straightens out and doesn’t tangle. Once your bouncer hits the bottom you need to find the strike zone from here. Hit the bottom and lock your bail. If the walleye are a few feet up hit the bottom with your bouncer and bring it up 1 to 6 cranks on the reel. Most bouncer fish will be caught from hit and lock to two to four cranks up. Use this same recipe for bouncers under the boat off the stern and bow. Usually, the bow will produce more bouncer fish because the boat is raising and lowering in the waves thus creating lure action on its own. The fisherman on the downwind side can do the same action to their lures by raising and tight lining their bottom bouncers back to the bottom. We use 2 hook Snell rigs for bouncers about three to four feet long to separate the lure from the bouncer weight. Structure fishing differs from deep water fishing in that it is crucial to know when you are on the bottom. Be prepared to break some lures or you’re not doing it right., however, if you are snagging up constantly you are not retrieving your line fast enough. Start with a 1/2 ounce sinker using the same rig as above and cast into the water and count down until you hit the bottom. Now on the next cast start your retrieve two seconds earlier before you hit the bottom. There are a couple of pointers I can share. The reefs are covered with Gobies a small fish that live right on the bottom. So when you feel a peck peck peck you are on the bottom and the peck it a gobie stealing your bait. When you feel this peck turn your reel handle 3 fast turns and then go right back to a steady retrieve. Always use a steady wind in shallow water. Do not drag hard on the bottom or you will snag up. Start your boat drift just off the edge of the reef so you drift up on and over the structure. Be careful and keep a very close eye on your sonar depth so you do not hit the bottom. Know your boat draft and keep a couple of extra feet of water under your boat for safety. The currents around shallow water will make your boat drift differently than you think sometimes so watch your chart plotter closely and beware of any wind shifts. Remember you are fishing shallow water so the walleyes will spook very easily. So, drift off the reef into deeper water before starting your boat up. Go out and around the shallows to make another drift. Be courteous to other fisherman and go around them and get in line. Be respectful. Cover the entire reef moving your drift over about a boat length per drift. You never know what part of the reef structure a school of walleyes is feeding. The walleyes could be swimming on the reef ledges, just off the ledges in the deeper water or right on top of the reef. 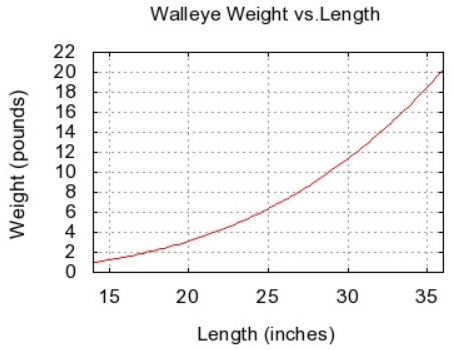 Walleye ranks as one of the most popular species of fish sought by most anglers. Book a charter and learn the different walleye fishing techniques. 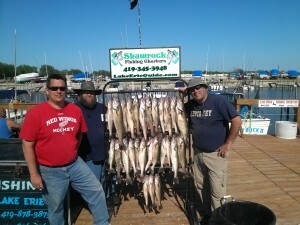 It’s great fun catching walleyes in the western basin of Lake Erie. You too will be hooked on catching walleyes. We typically start the walleye fishing season in late March to early April depending on the winter ice thaw. In the early part of the spring, we will be fishing shallow water humps jigging hair jigs tipped with minnows. As the summer heats up we will begin to add trolling to our walleye catching arsenal. Walleye trolling is highly productive on days when there is simply little to no wind for drift fishing, we can flip over to trolling. These are common occurrences in the summer and fall months but not to worry … trolling for walleye is some of the most exciting, action-packed fishing trips to be had on Lake Erie. Our trolling techniques are hands-on. We use jet divers to take our spoons to the desired depths for catching walleyes. Your captain and first mate will teach you how to set a jet diver, dipsy diver, and use a line counter reel. We run several lines off each side of the boat using planer boards. You attach the rod line with a clip to the planer board line and let it slide down the tow line.